If you are looking at buying the new HTC Rhyme Android Gingerbread 2.3 smartphone, and would like to know about release dates and where to buy from in the US and UK, then look no further. Here are a few details on where to buy the HTC Rhyme phone, you will be able to pre-order this device via Target on September 21 according to Droid-Life, you can also visit the Verizon sign-up page for interest who will then start selling it this Thursday. 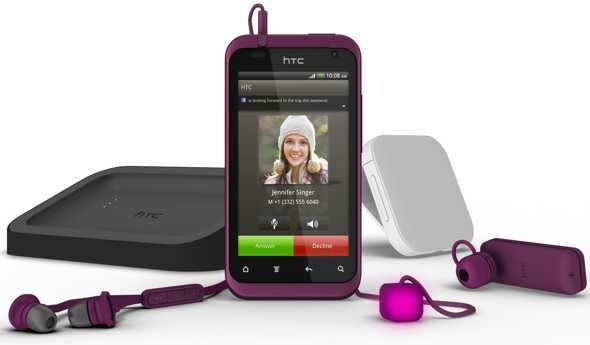 The above covers the US and we gather many other online retailers will sell the HTC Rhyme, now moving into the UK market. Clove Technology will be selling the smartphone and we received an email via Clove Technology Sales mentioning that the HTC Rhyme will be on sale as of October 8th, the plum coloured smartphone will be an O2 UK exclusive, this means that O2 will be the only UK seller. SIM free stock is expected slightly earlier, due in on the 8th instead of the 17th for O2. Just for a little more O2 UK HTC Rhyme verification we have a couple of tweets via O2 themselves: Breaking news – we’ll be the only UK network to have the just announced HTC Rhyme! When can you get your hands on one? From 17 Oct! Please visit Twitter. The specifications are nothing spectacular, but they are reasonable. Main features include Android 2.3 Gingerbread operating system, 3.7-inch touchscreen display, 5-megapixel autofocus camera with LED flash, HTC Sense 3.5, 1GHZ single-core processor, 3G, Wi-Fi, Bluetooth and much more. Is this phone for women only, or will it will the hearts of all Android lovers? Take a look at the YouTube video just for you of the HTC Rhyme smartphone.